Our bargaining team returned to the table this week boosted by strong weeks of solidarity actions with members statewide standing up and purpling up for a contract we can all be proud of. Our voices echoed up and down the state as we delivered the message that California is the sixth largest economy in the world and—in our California—people who work hard for a living should be able to provide for their families. In Sacramento, hundreds of members marched and picketed at the headquarters building of the California Department of Education. “Now more than ever, it’s critical that we continue to rise up,” said Tamekia N. Robinson, Local 1000 Vice President for Organizing/Representation, at the Sacramento action. “Right here. Right now. We are making the difference.” Nurses marched against Mandatory Overtime in Chula Vista at the Department of Veterans Affairs. 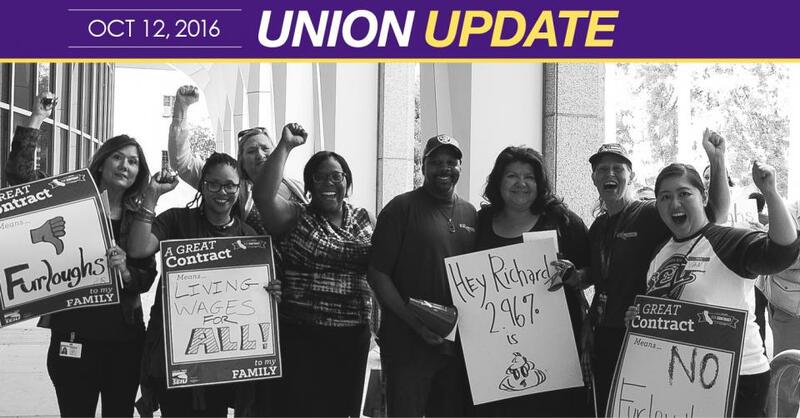 Members fighting for fair pay took to the streets outside of the Caltrans office in Oakland. Calling for better rural health care options, our members stood strong at the High Desert Prison in Susanville. We also marched in Stockton, Norwalk, Ontario and Napa. At the same time, we sent messages directly to CalHR director Richard Gillihan, calling for a contract that values our work and respects the services we provide. We told our personal stories about what a contract we can all be proud of means to us and our families.